We are a coalition of Berkshire County citizens and professionals who come together to identify the connections between animal cruelty and human violence. As professionals in the fields of education, animal protection, human services, law enforcement, and veterinary medicine we work to find ways to make Berkshire County a safer, healthier, and more humane place for people and animals. Or view our longer video with more information about HAVEN. Thanks to The Shirley Shattuck Charitable Trust for funding our video. To make Berkshire County a safe and humane place for animals and people through the development of a broad-based coalition concerned about the links between human violence and animal cruelty, to inform and educate the public, and to foster ongoing communication and collaboration between professionals to address violence in all its forms. To report domestic violence, animal abuse or child abuse use the resources provided here. 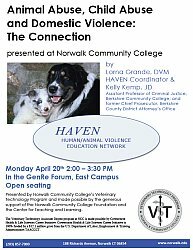 HAVEN Coordinator Dr Lorna Grande will be a speaker at the Mass Veterinary Medical Association's conference of mandatory reporting of animal abuse. "Meow" or "Woof" - However you say it, it's thank you! "Each product you buy, we give a shelter dog a blanket"
This is the philosophy of Jessica Mashkevich, Chief Comfort Officer of Kona Benellie inventor of the Throwbee. When Jessica heard that HAVEN worked with the Elizabeth Freeman Center/Berkshire Humane Society's SafePet program she generously donated scores of brand new blankets for animals in shelters and foster care. HAVEN was thrilled to donate blankets to the Berkshire Humane Society and the Eleanor Sonsini shelter in Pittsfield, MA. Also enjoying the comfy blankets are the residents at the TJ O'Connor Municipal Animal Shelter in Springfield, MA. TJO is the largest shelter in MA. Thanks to reporter Paula Owen of the Worcester Telegram and Gazette for this wonderful article featuring HAVEN. First animal to be included in restraining order under the new MA law. We are sorry the family needed to use this but happy it was in place to protect them all. We hope they will be reunited with their dog soon. GREAT NEWS! 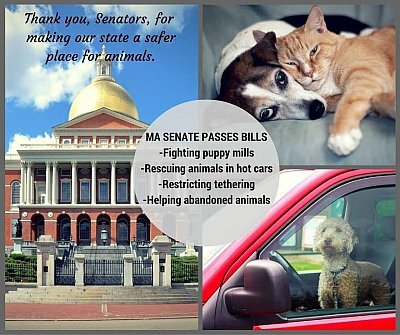 The bill to include animals in restraining orders was passed by the MA legislature and signed by Governor Patrick in Aug, 2012. This bill focuses on much needed updates to the animal control laws as well as the ability to include animals in protective orders. Congratulations to everyone who helped to pass this important legislation. 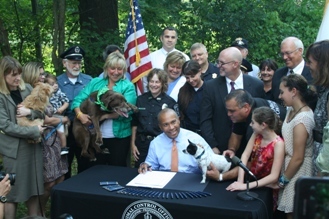 Massachusetts Governor Deval Patrick Signs S.�2192! - Lots of great photos from the event at Dog Breath Photography. 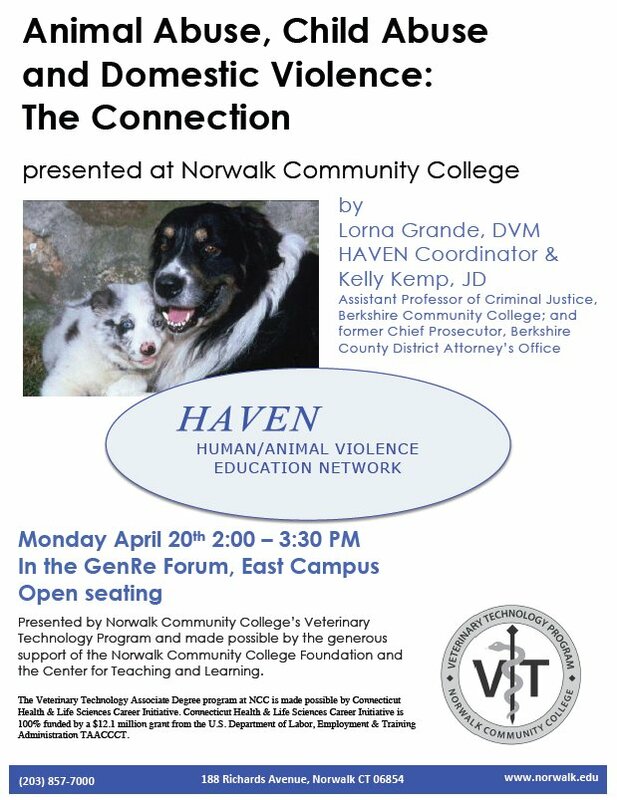 The development and implementation of general and profession-specific educational programming about the links between animal cruelty and human violence. These educational programs have been the core of HAVEN programming. If you would like to discuss having a FREE presentation from HAVEN at your organization, please contact us. Request a Training. 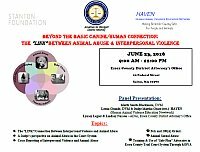 HAVEN has many partners from the fields of DV, social work, law enforcement, veterinary medicine, etc so we can tailor a presentation to your needs. We provide relevant resources your staff can actually use locally! "Interesting information, loved video included and energy of presenters"
"Great presentation! Very impactful and a lot of helpful resources"
"Interesting, they both presented well and shared lots of new information. I enjoyed this presentation"
"Loved how the presenters related their info to all that we do at SAFEPLAN and that they gave us lots of resources"
"This training was really interesting! The intersections between violence or cruelty towards animals and how this intersects domestic violence was eye opening. The need to document this needs to be explored fully as I don't think this happens as much as it should or as accurately as needed in these cases. 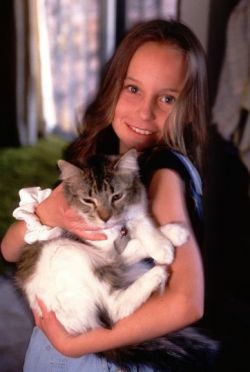 I think often our focus is on the children and not understanding what other things have taken place in the home such as violence towards the animals in the home." "I loved the training overall and I love that there's always room for new ideas! 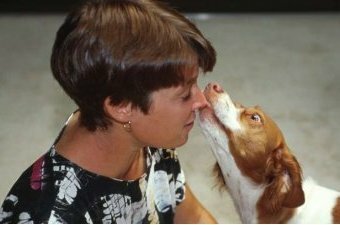 ...For example, the piece about interviewing children on their pets and violence directly related by their caretaker or other family member is so key! This is a great way to obtain information we are looking for." "...I started reading the book and man what an eye awakening. Thank you for teaching in that we pay closer attention to cues of animal violence and cruelty and how it interlaces with human trauma. Well wishes to all humans and animals alike." HAVEN founder Lorna Grande was introduced to the police aspect of the connection between animal cruelty and interpersonal violence by two men. Paul Johnston and Tom Flanagan. Both over 30 year veterans of the Boston Police Dept. Paul passed away this weekend and we are deeply saddened. His soft spoken, kind interactions with people will always be remembered. Thanks you, Paul for all you did for animals, human and non human, you will be missed. Our thoughts are with his family and friends. We are proud to announce that HAVEN partner Berkshire County Asst District Attorney Kellp Kemp is this years recipient of the Mass Veterinary Medical Association's Merit Award. Kelly is being honored for her tough prosecution of animal cruelty cases in Berkshire County and her efforts through HAVEN to educate other prosecutors in MA. Kelly is the Chief Prosecutor in the DAs office and an adjunct faculty member in the Criminal Justice Dept at Berkshire Community College. She is featured in this month's Animal Life Publication, pick up a copy! Congratulations to Kelly, everyone at HAVEN is very proud!! See you at the Awards dinner! "...After this eureka moment, Grace sought out Grande as a mentor during the month-long externship required for the degree in animals and public policy..."
"...Receiving the offer of free labor from a hard working, motivated student is always good news, however this news was different because the student is a retired juvenile court judge!! The Honorable Chief Justice (ret) Martha Grace has been working with HAVEN for the month of January..."
"...Dr. Lorna Grande, coordinator of the Berkshire Country-based Human/Animal Violence Education Network, said her coalition had found in 88 percent of the child abuse cases they handled, pets in the home were also subject to abuse or neglect..."